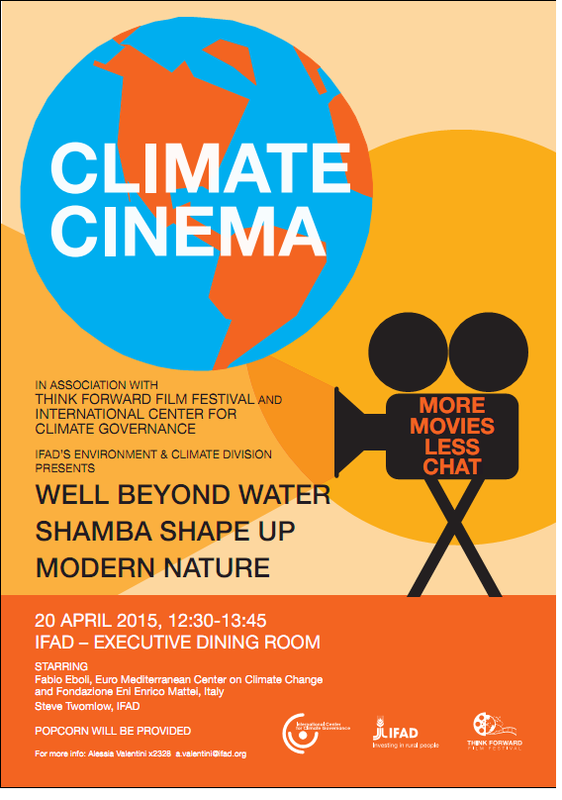 On April 20th IFAD’s Environment and Climate Division (ECD) hosted its third Climate Cinema. The first film shown was ''Well Beyond Water'' by Andy Ross, shot in Australia in 2014. This was a personal documentary filmed by English composer and musician Andy Ross who finds himself immersed in the unlikely world of Australian sheep farmers who are dealing with a prolonged and difficult drought. Contrary to his expectations he discovers an inspiring farmer who is finding ways to adapt to the challenging climate. The farmer raises questions about the meaning of drought and points to a need for cultural change and adaptive strategies. Next up was Shamba Shape Up. In 2014 IFAD was one of a number of partners in Kenya's most watched agriculture TV show. Airing on Citizen TV on weekends, it’s watched by over 13 million people in Kenya, Rwanda and Tanzania. Most viewers are farmers. This makeover-style programme aims to give farmers the tools they need to improve their productivity and income. The Shape-Up team visit a different farm each week, along with experts from partner organizations who specialize in the topics to be covered in the episode. In this episode, the Shamba Shape Up team build a ''flexi biogas'' unit on a farm. Lastly there was ''Modern Nature'', a film by Craig D Leon from Brazil. By the year 2050, 10 billion people may populate Earth. Do we need a genetic revolution to feed the world? Modern Nature takes the viewer on a non-narrated odyssey where viewers explore the challenges that mankind faces and whether organic or GMO is the answer. Filmed in Brazil, Ecuador, the US, St. Kitts and Nevis, Modern Nature is an award-winning documentary which includes perspectives from 5 continents, including MIT philosopher Noam Chomsky, Delhi-based environmentalist Vandana Shiva, and Los Angeles street farmer Ron Finley.